The larval neuromuscular circuit is highly stereotyped with single cell resolution due to the limited number of motor neurons (32) and muscle targets (30) per hemisegment. Motor neurons in the ventral nerve cord must send their axons into the periphery and faithfully innervate their appropriate muscle target(s) (Figure 1). This system provides an ideal platform in which to tease apart the molecular determinants that contribute to this hard-wired specificity. Additionally, previous work (in collaboration with Kaushiki Menon and Kai Zinn (Caltech)) identified roles for dpr11 and DIP-gamma in motor neuron development (Figures 2 and 3) and optic lobe connectivity. 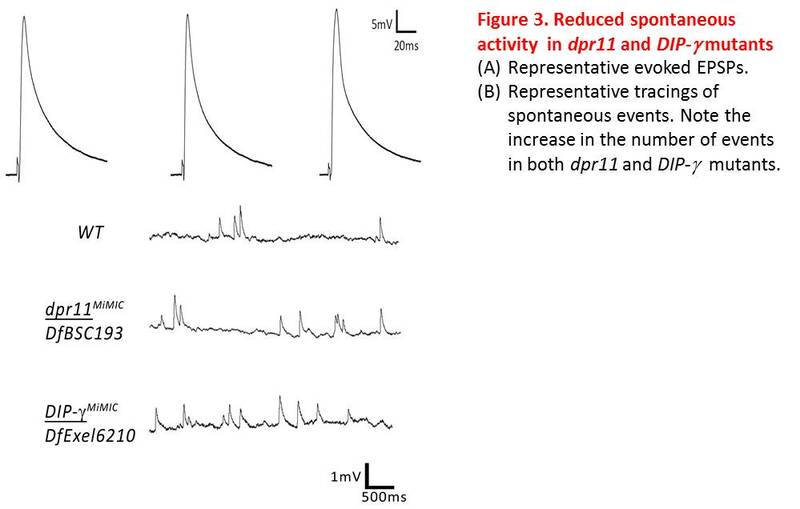 Recently, we found that a Dpr-DIP pair controls the targeting of a specific motor neuron to its corresponding muscle. This unique phenotype will serve as a model to delve deeper into the molecules and mechanisms that function in Dpr-DIP regulated wiring. After the motor neuron has found its appropriate muscle target, the axon terminal must compensate for the drastic increase in muscle surface area. A combination of anterograde and retrograde signals allow for motor neuron-muscle crosstalk in order to maintain synaptic efficacy. 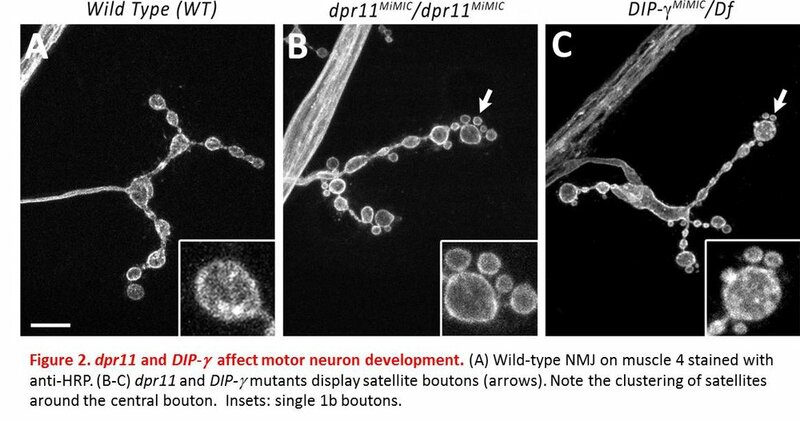 We previously found that Dpr11 and one of its binding partners, DIP-gamma, regulate motor neuron development via the BMP pathway. We are actively testing if other Dprs and DIPs also have a similar function with the hypothesis that some Dpr-DIP pairs may regulate early motor neuron targeting as well as subsequent axon terminal growth. Experimentally, we are using a combination of forward and reverse genetics, biochemistry, electrophysiology and optogenetics, behavioral assays, and cell culture studies to answer these questions.